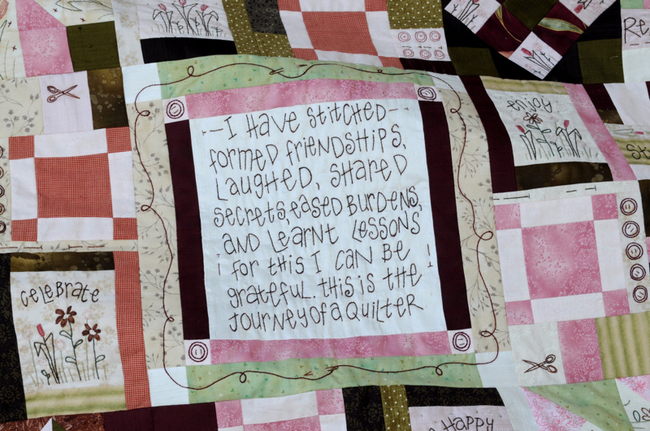 Hi All, I’m so pleased to announce that Journey of a Quilter is back. 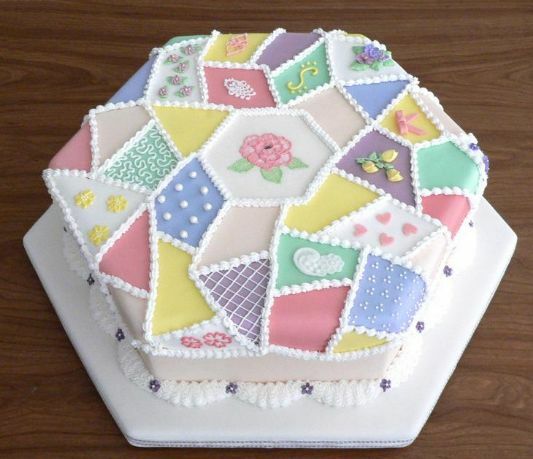 It’s by far the most popular quilt block of the month we’ve done to date! 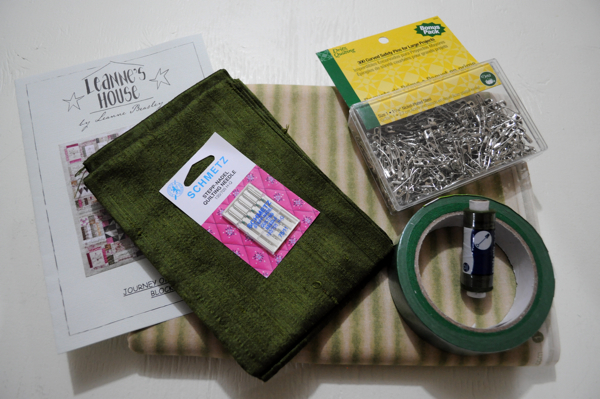 With the scrappy, now I mean scrappy – 20+ fabrics, beautiful hand dyed weeks floss, dupioni silks, silk pins, embroidery needles, sewing machine needles, private step by step blog postings and close up pictures…what more would you like? Well it’s coming…3 options to choose from so pick the one that works for you and your schedule…maybe you are the type that wants everything at once – done. But maybe you are the type that wants to receive a special kit in the mail each month – done. 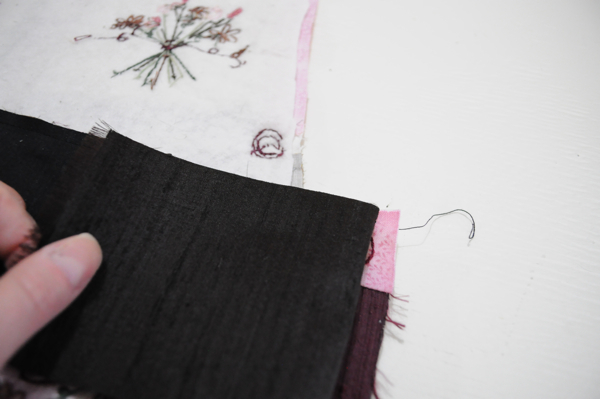 And maybe you want to do it in black, white and red from your own collection – done or you want me to put together a special colour – you just let me know that you’d like purples or blues and I’ll put something special together just for you! 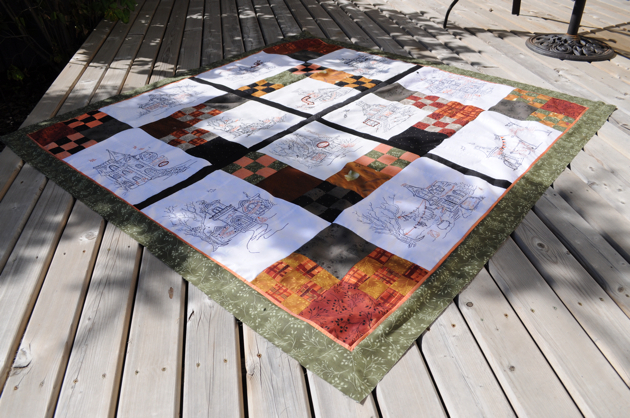 Would love to see you all play along…please sign up for Journey of a Quilter 2013 – today! 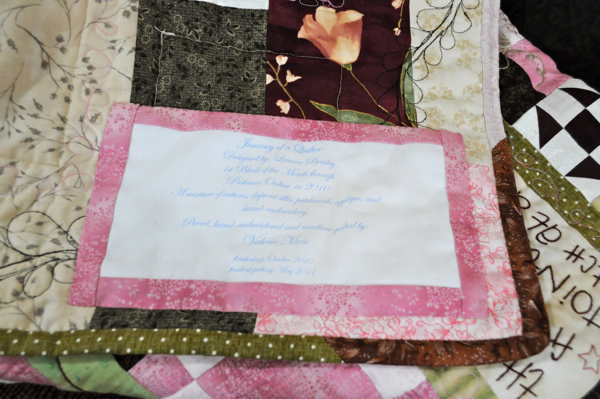 —-as a little side note here’s Kathy’s Journey quilt in her choice of fabrics – isn’t it just devine? This Raspberry Crumble makes my mouth water..yummy! 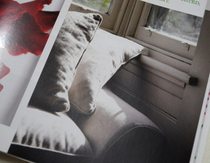 How about curling up in this chair to do your stitching – looks perfectly comfortable for me and Tig! 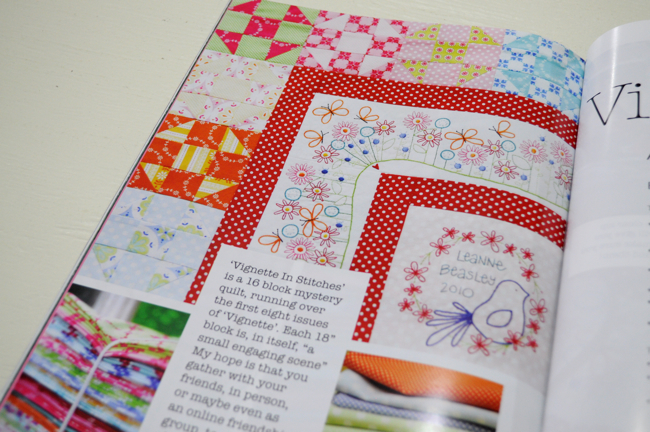 Last but not least or should I say the main part of this mag is this incredible 16 part block of the month project starting from Issue 1. 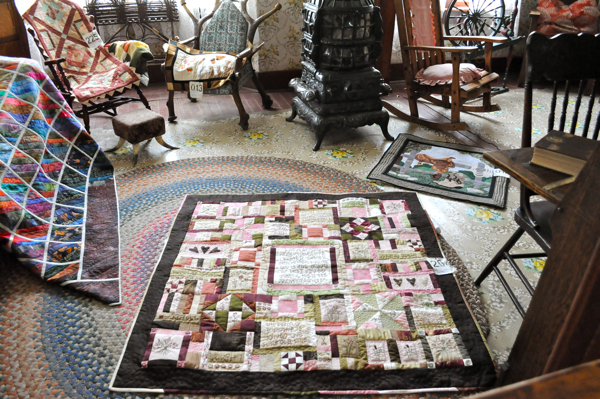 See Kathy’s start in this recent blog post, Show off YOUR Stuff, she may just inspire you. 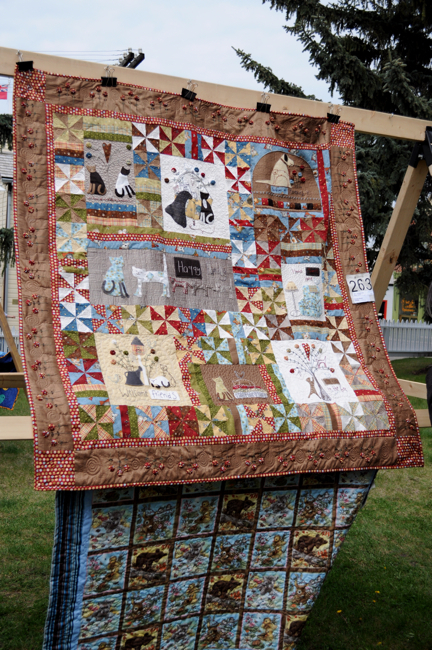 And here it is at Heritage Park, Festival of Quilts this year…I’m super happy with how it was displayed…how many of you put their quilts into Heritage Park this year? 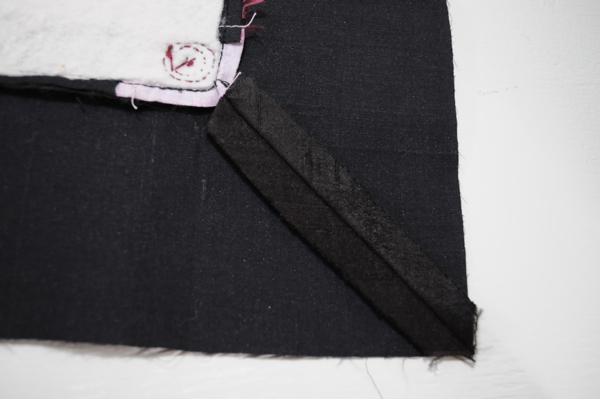 cut the batting – check! 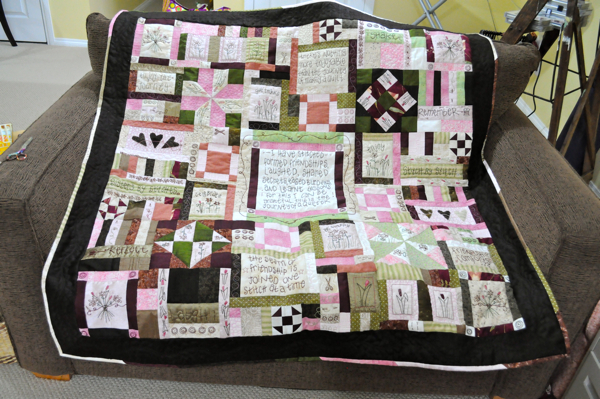 the back was pieced last year and just waiting patiently to be used – check! 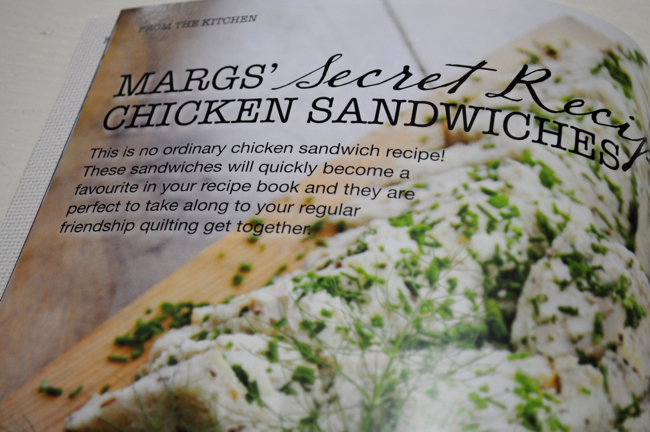 crawling around on the carpet adding a million basting pins, sore knees – check! 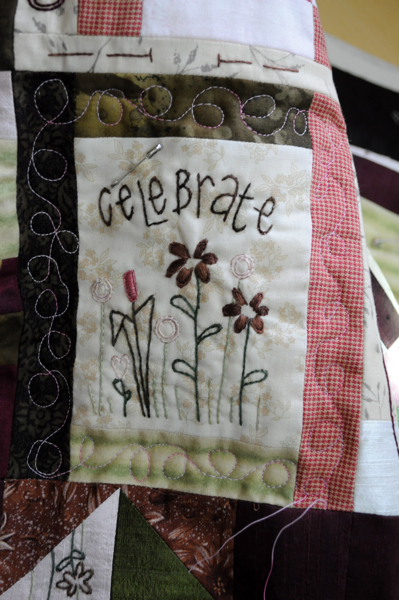 Thanks to Jen who stopped by for some stitching that day – good motivation to get pinning! 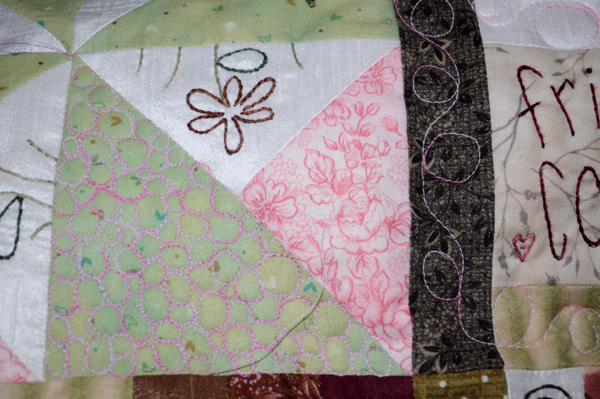 Practicing my free motion quilting from Ana’s class (which I learnt so much). 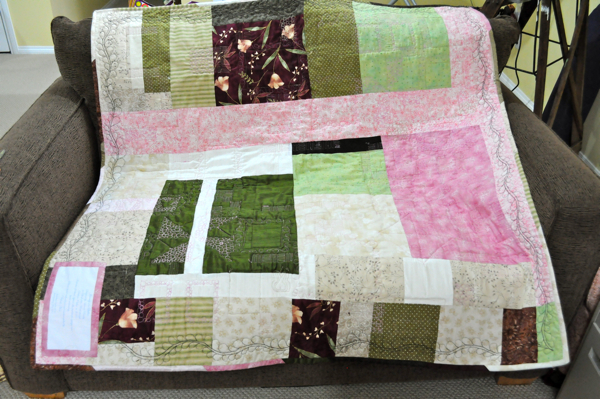 I only used my free motion quilting foot on this project what a learning curve but I think I’m getting it finally. 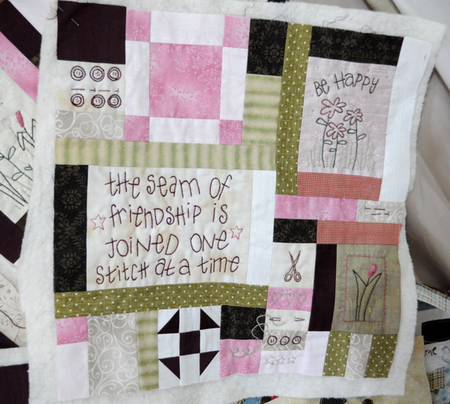 I’m thinking this pebbling filler stitch is my new favourite!! 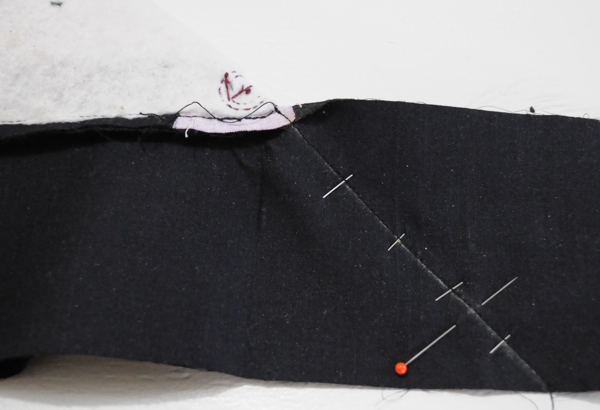 I’m not kidding it’s super easy to get into a groove with this stitch, I’m in LOVE! What do you think? 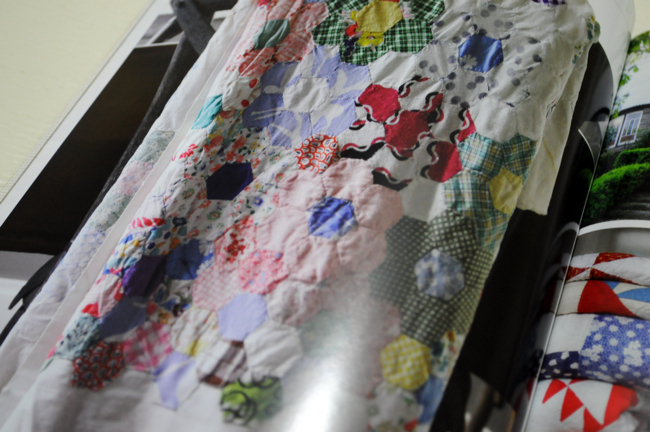 Liking it aren’t you? I have more pics to take and show you, I’ve done quite a bit more since these were taken so I’ll get more pics here to show y’all. 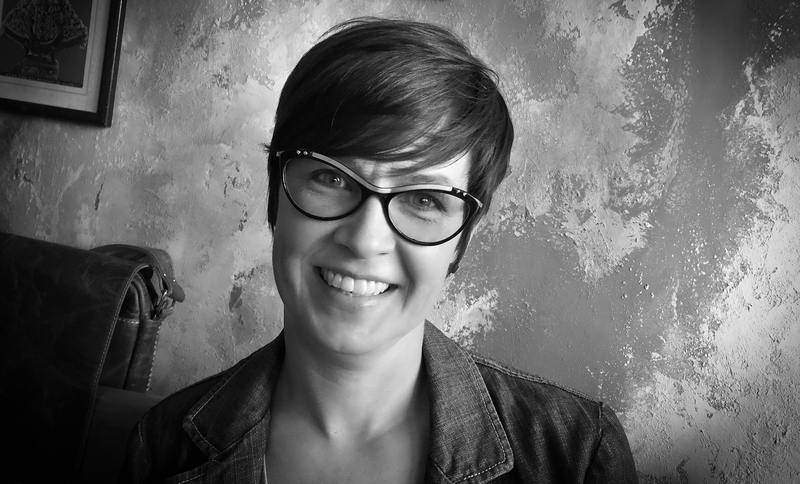 Sew I got this interesting email from Leanne Beasley…sound familiar? 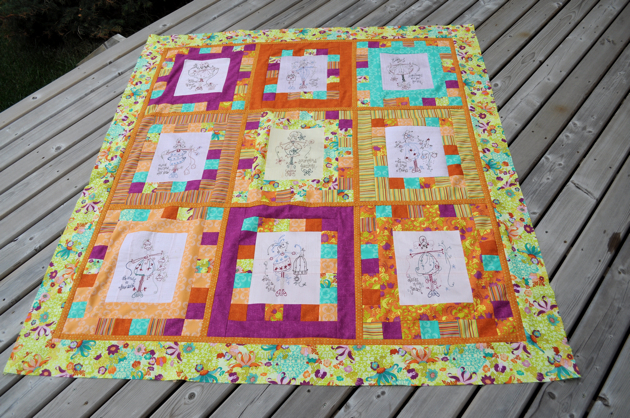 She’s the amazing designer of Journey of a Quilter here’s a pic for those of you who’ve missed this awesome block of the month we did in 2010. 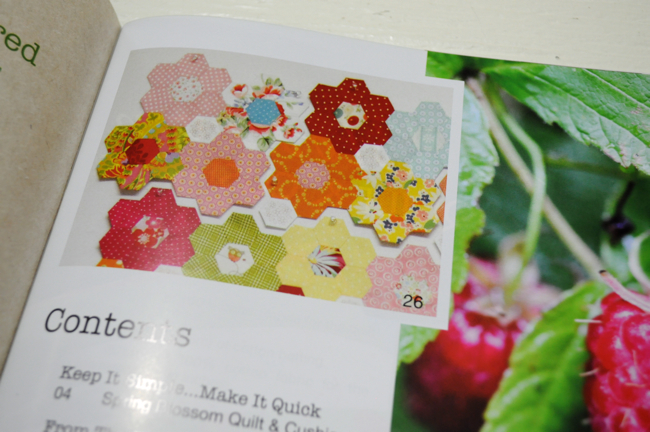 This is the picture of Leanne’s pattern front – can you say amazing? 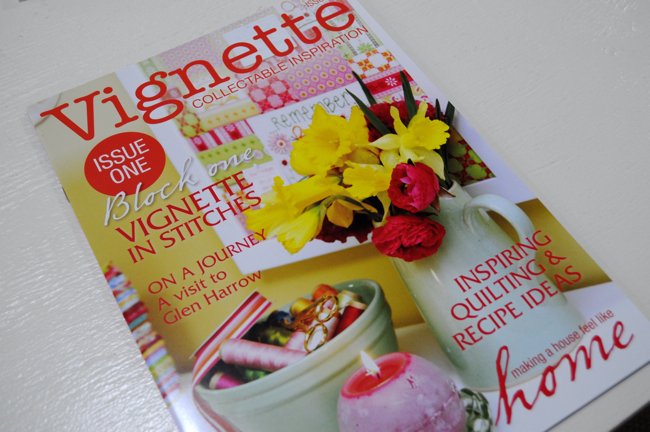 So now that I have your attention, Leanne’s contacted me regarding carrying her brand new magazine called Vignette…”Vignette magazine is a quarterly visual delight filled with ideas for your creativity, your home, your garden, your kitchen, and much more! 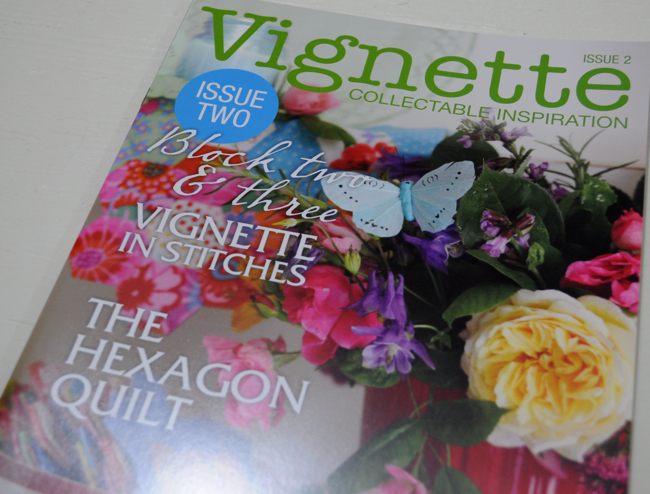 Issues 1-8 include the latest BOM pattern, ‘Vignette In Stitches’. 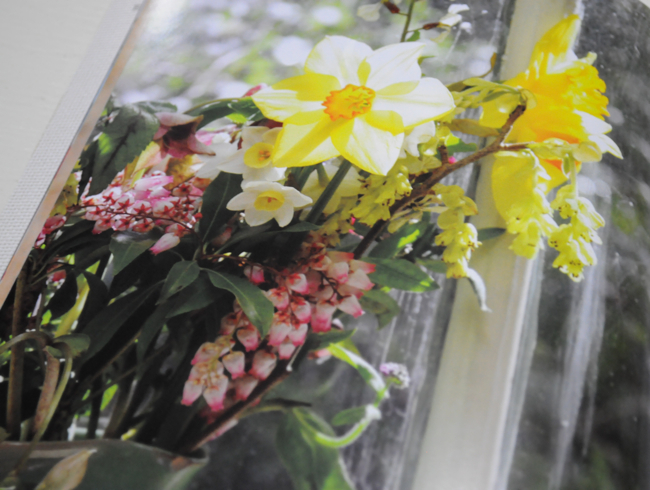 TIP: Keep and old plastic container with a tight lid to dispose of used rotary blades. If these are thrown in the trash, someone handling the trash could cut themselves on the blade. 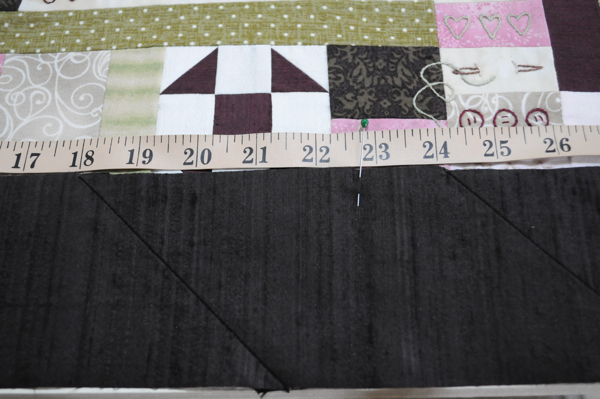 you will need 52″ (45.5″ + 6 (extra for mitering at the corners) but leave it at the 58 so you have some extra when doing the mitering). I always connect strips in the same direction. 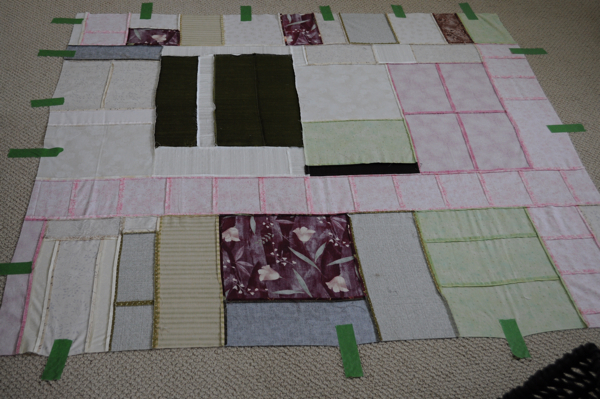 Right side facing up, on my left hand side, add the extra strip on the right with the right side of the fabric facing down. 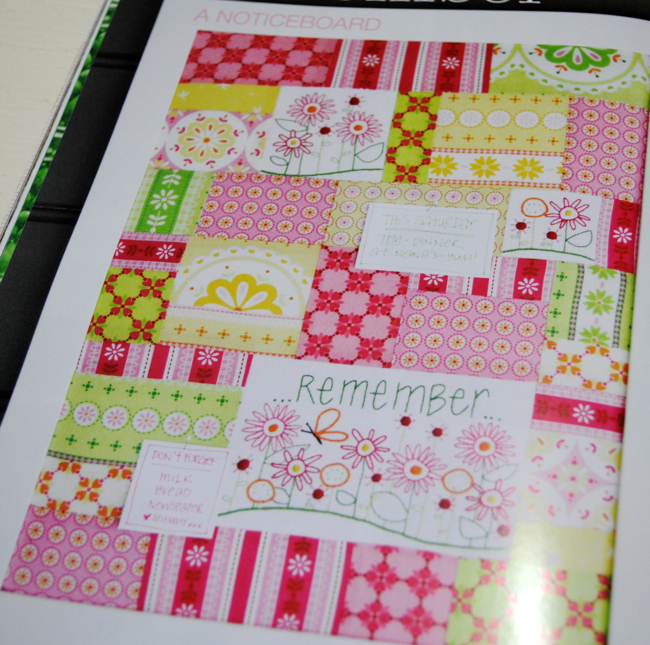 I do this the same when when I connect any strips together regardless of the width of the strip, borders, bindings always the same way. If you don’t do it always in the same direction, you will notice it so much because one diagonal will go one way and another will go the opposite way. 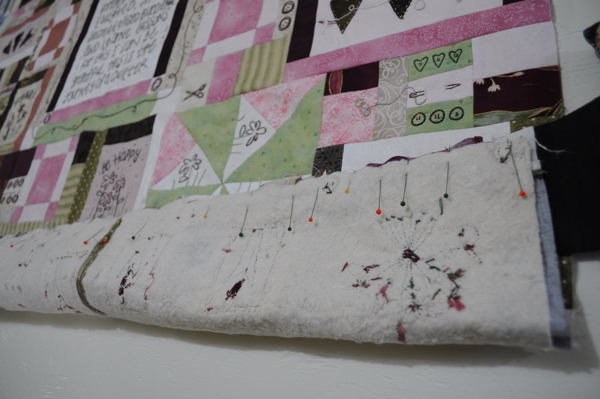 One thing with quilting is you need to find your rhythm. The way that makes sense to you so that way you will become an expert at the technique. 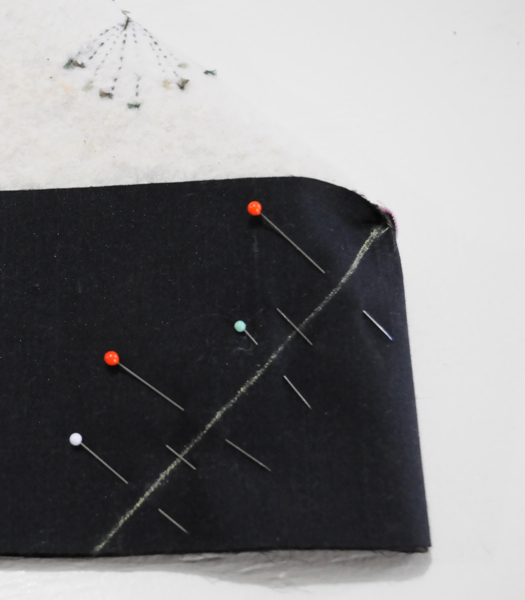 Sew across, make sure your needle position is in the center and not set to 1/4″ seam allowance or just be conscious if it is when connecting these on the diagonal. 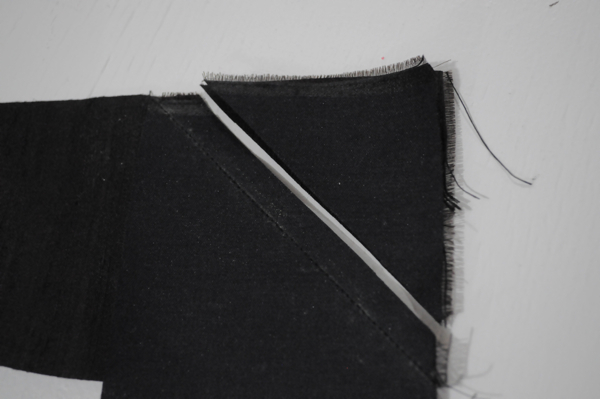 with scissors or a rotary cutter, remove the excess leaving 1/4″ seam allowance, press really well to set the seam, them press open. 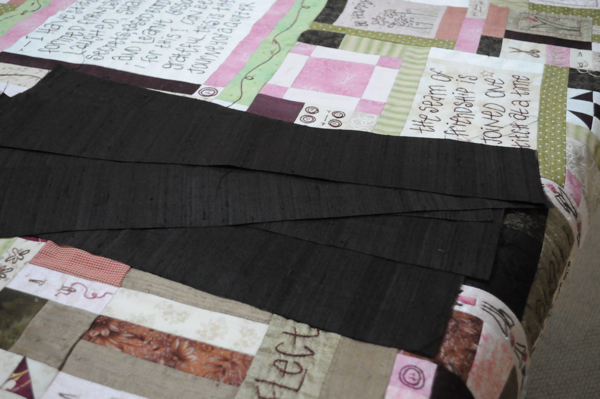 Here’s what your border strips will look like. 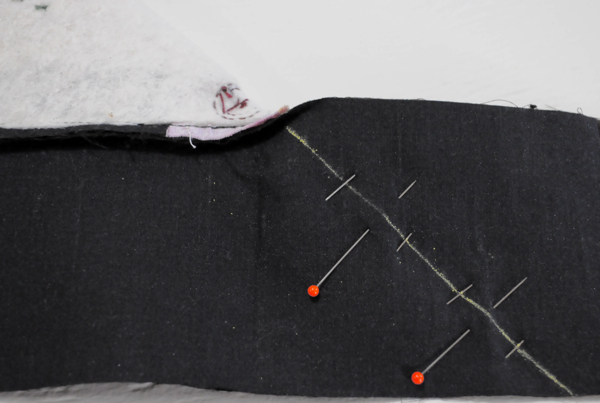 Remember when I mentioned the direction of the seam is very important how you connect your strips because if they aren’t connected in the same way, the seams from the front will go in opposite directions…here’s the correct way when all the strips are connected in the same direction. 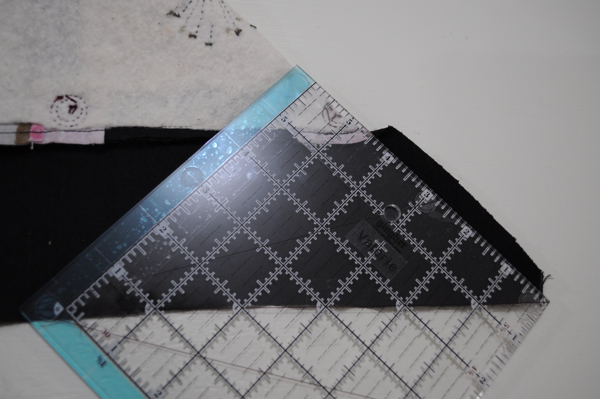 I’m going to show you how to do mitered borders, so the corners of your borders meet at a 45 degree angle instead of square. 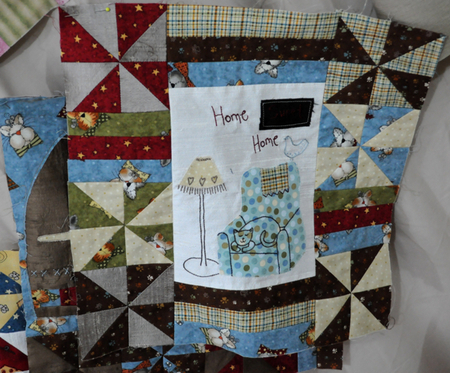 This quilt needs an amazing frame whether you hang it on the wall of lay it on a chair, trust me the results are fabulous! 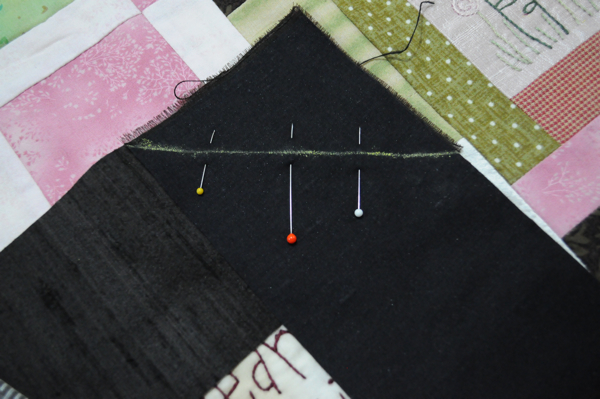 Finger press your quilt top in half, mark with a pin, this is your center. 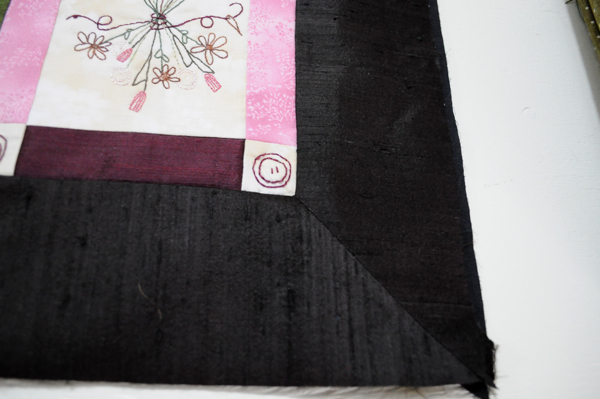 Finger press your border fabric in half, mark with a pin, this is your center. 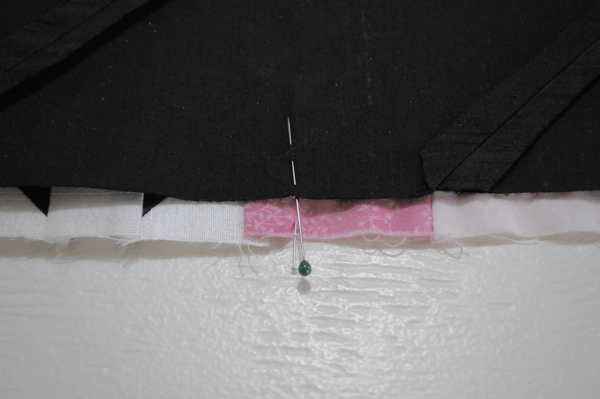 Start pinning from the center then towards both the outside edges. 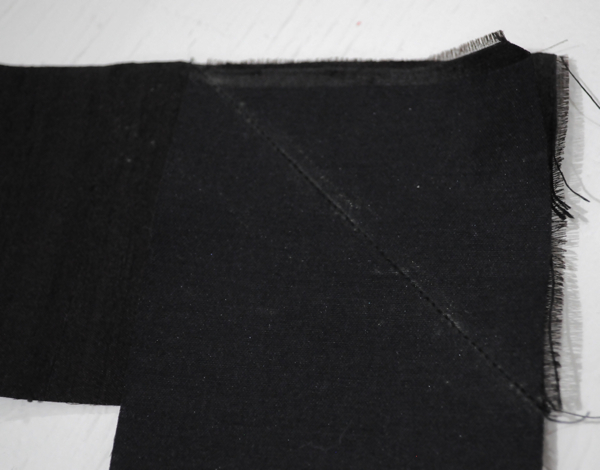 When you do mitered borders, you start sewing 1/4″ in from the end, be very exact here, then backstitch at that point, sew along full length, watching your seam allowances that they are nice and flat while sewing, stop 1/4″ in from the other end, back stitch. 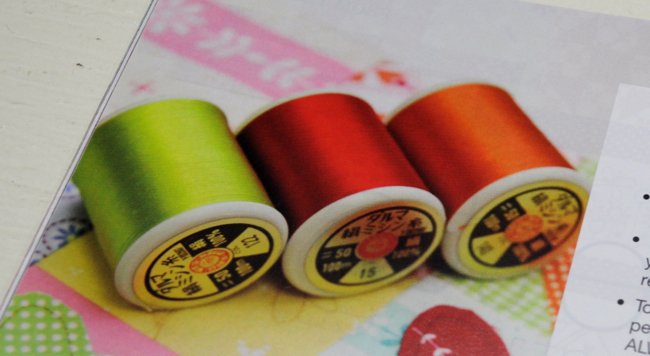 You can mark this 1/4″ with a pencil, pin or whatever works for you to remember to stop and backstitch 1/4″ in. repeat the same thing on all 4 sides. 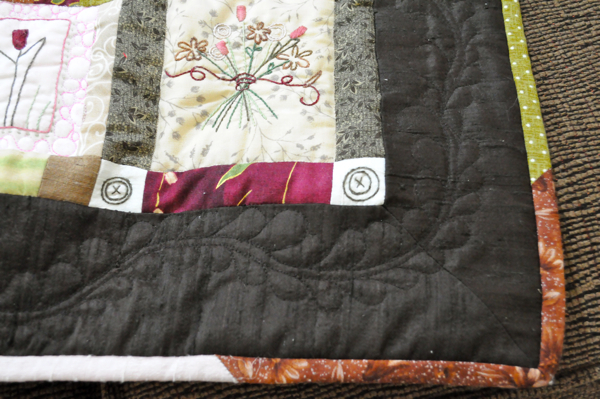 With right sides together at 90 degrees (top and side) you will match the borders, perfectly, pin in place to hold while you mark your diagonal, line your ruler up, see how my 45 degree marking on my ruler is flush with the bottom of the quilt when it’s folded? 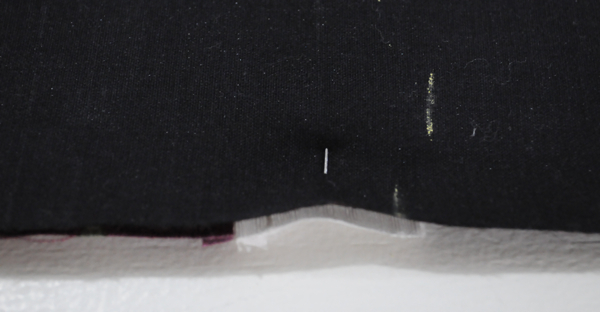 mark this way from both sides, this will ensure you have the correct angle, you can pin from both sides also, if you put a pin through your line on one side it should be in the line from the other side. 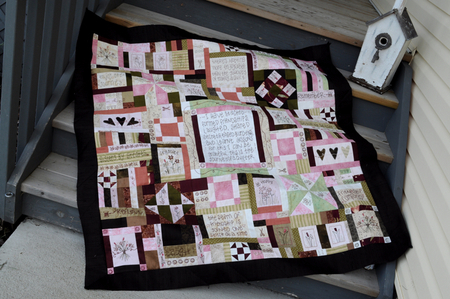 Here’s the front…Did you try this, are you happy with how it turned out? Until next time, stay happy, mitered and creative! 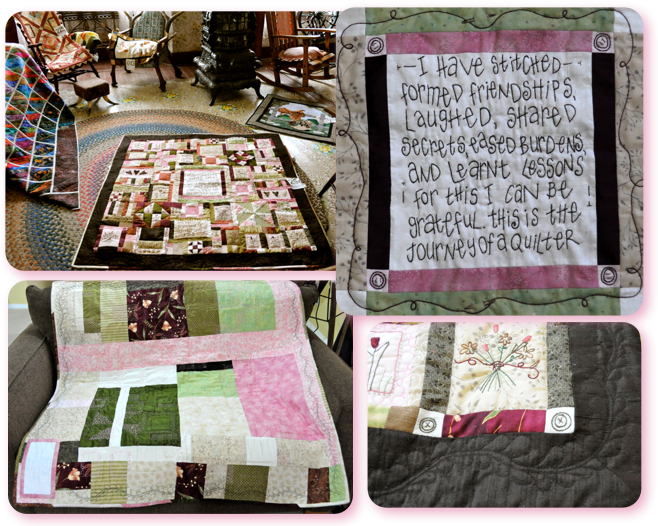 Hi everyone, okay final pics of the Journey of a Quilter Top – it’s finished and I’m so proud of it!! 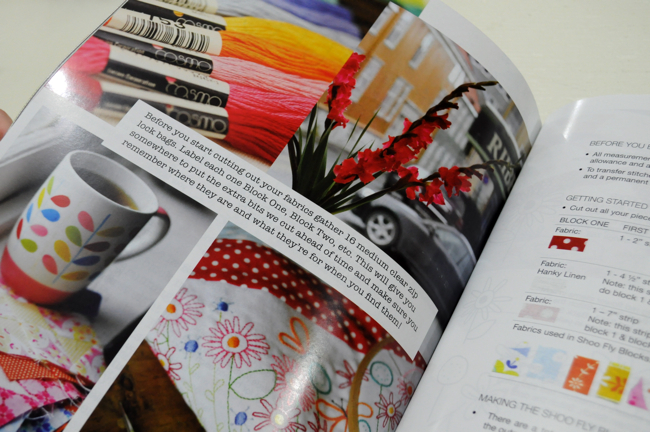 Here’s what you get in your finishing kit in your chosen colours: backing, binding and hanging sleeve fabric, silk quarters for your borders and matching thread, tape for layering your quilt, 300 safety pins for basting, Machine Quilting needles for your quilting needs….how does this sound? 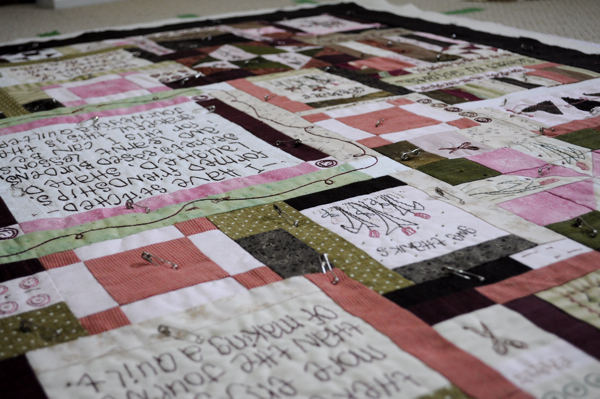 So I’m finallying catching up on a few blocks. 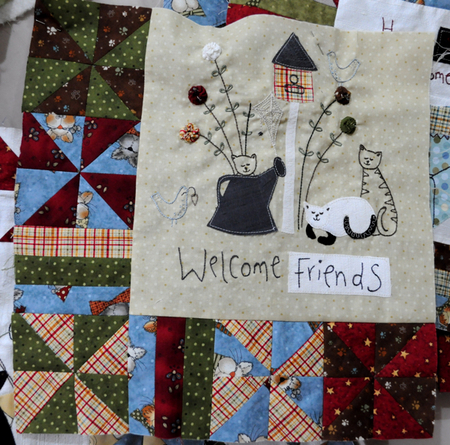 First, A Kittens Tale Block 5, I’m loving this special little quilt with the pinwheels, applique, combination of silks and fabulous fabrics this is going to be a super delightful quilt when it’s finished. 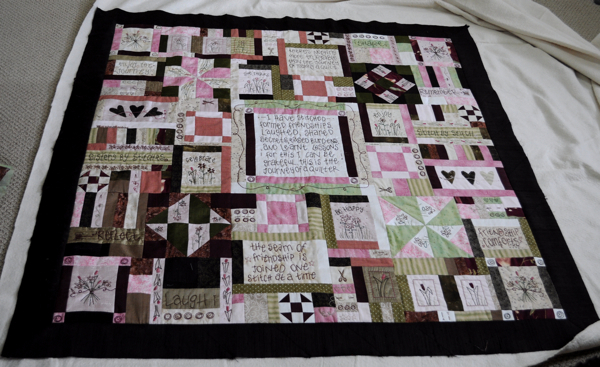 AND I’ve finished Journey of a Quilter Block 8, pieced Journey of a Quilter’s Block 9 and working on the cutting & finishing instructions for both!! 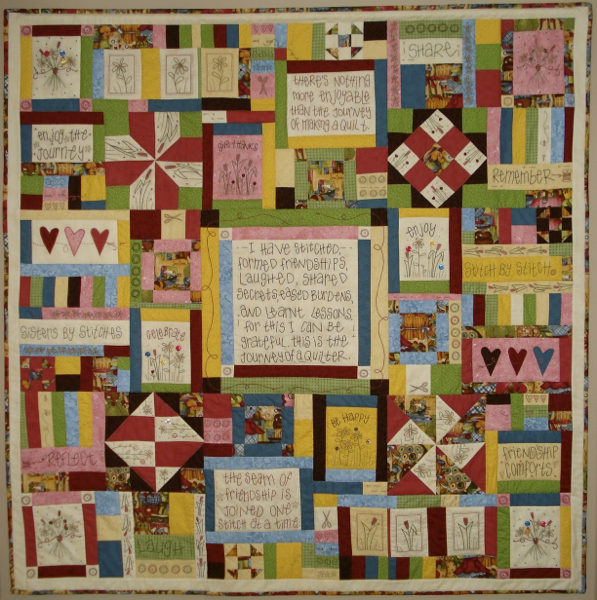 Thanks so much to the whole bunch of you who’ve par-taked in this great quilt and to the whole lot of you who’ve recently joined, such an awesome club to launch my 1st Block of the Month club, what a success! !